I worked from Daphne, AL last week, on the Eastern Shore of my hometown, Mobile, AL. One of the great things about working from a home office is the ability to call anywhere with an internet connection “home,” especially thanks to Skype. Last weekend my mother turned 60. She’s no typical 60 year old though, and for her birthday wanted to go deep sea fishing out in the Gulf of Mexico. 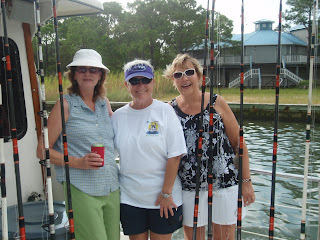 So I called her favorite charter – Captain Mike Theirry, who operates out of Dauphin Island, AL. The Thierry’s have been around a while. Mom’s mother used to go out fishing with the Thierry’s on their boat Lady Ann. 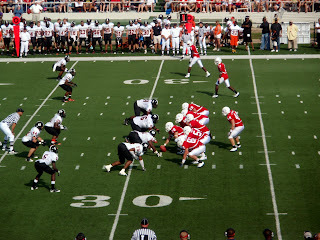 We were tired to start the day because the day before was the inaugural football game for the University of South Alabama Jaguars, complete with a huge tailgate at Ladd Peebles Stadium. My mother, older brother and I all received our undergraduate degrees from USA. I’m proud to announce the Jags won that game. So the next morning we got up very early for a 50 mile drive over to Dauphin Island, where Mom’s best friends had already gathered and decorated the boat to surprise her. Mom didn’t know I had called her friends (two of them had driven down from Tuscaloosa) and that they would be with us that day. She was very surprised and very happy. Unfortunately the weather didn’t quite cooperate with us. We caught some fish, mostly Trigger Fish and Ruby Lips, but when we got boxed in by storms we decided to call it a day early. 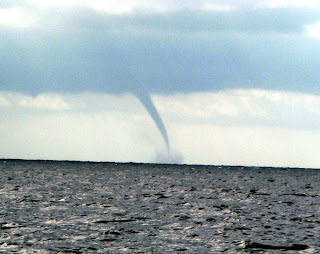 The water spout you see in the photo is one I took from the boat that day, so you can see why we decided not to tough it out! Monday was Labor Day, so all the friends and family in town came over for a fish fry, because that’s how everyone in the south eats stuff – deep fried. My little brother, William, has a giant fryer (in which he makes wonderful fried turkeys for holidays), so he took care of the fish (except for the ones dad grilled, since I don’t eat fried fish). All I can say is by Monday night we were all thoroughly exhausted, but very happy. I was able to visit with my niece and nephew, now 6 and 8, during the week, which is always fun and interesting. This was a particularly tough week for them though, as they were in a car accident (everyone was fine) and then two days later the niece suffered a broken arm. The arm was broken because her brother (and I quote) “body-slammed me on the floor.” And still she let him be the first person to sign her cast. Kids are so forgiving. 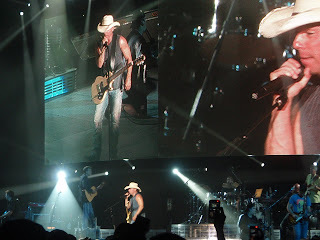 On Thursday night a friend hooked me up with some free tickets to the Kenny Chesney and Miranda Lambert concert in Biloxi, so mom and I drove over. The tickets, while free, were not good seats. Moments before the concert began we ran into Steve Nodine, now county commissioner in Mobile. I hadn’t seen him in years so we chatted a bit and he immediately upgraded our seats to some of the best in the Colosseum. I think I love free stuff better than about anybody alive. But better than that, there’s something about coming home: running into old friends, taking care and being taken care of, years of memories, familiarities (knowing the back roads), being known and understood and remembered, that just makes it special and irreplaceable. No matter where I’ve been, where I’ve lived, or where I’ll go, I know that nothing else will ever feel like that.